HAVING a toddler can be a bit tricky during the school holidays – playgroups tend to close for six weeks, soft play becomes a bit of a danger zone with older children running around, and attractions that are usually quiet are overrun with families trying to keep little ones entertained. So knowing that our options might be limited for a few weeks, we decided to head to Folly Farm before the holidays started so we could enjoy it while it was still fairly quiet. We’ve been to Folly Farm a fair few times over the last year, and each time we do something a bit different. On our second visit, Stew decided it would be a good idea to get a membership card as you start to make your money back by the fourth time you go (I think he just likes to collect memberships as we have a few now!) so it’s nice to have a spontaneous day out without the cost of entry tickets. It’s an hour away from us, which is long enough for Santi and Ezra to have a nap on the way there, but not so far that it seems like a huge trek. Anyway, last week we headed off in the car to Pembrokeshire despite it being a pretty wet and windy day (British summertime, hey), for our first visit as a family of four – plus my mother who came along for the day. Luckily Santi was happy to look around the barn area first so we could stay dry as it was quite drizzly outside. He loved seeing some tiny piglets, guinea pigs and rabbits, and watched a goat being milked. They have activities throughout the day, like meet and greets with certain animals, talks and face painting. Because of the weather, we spent most of the visit indoors this time, heading for food at the Funfair Restaurant before Santi and Stew went on the carousel and giant slide while me and my mother had a coffee to warm up. The indoor play area is great, and wasn’t overrun even though we’d spotted a few coaches outside and expected a lot of school trips. There’s also an indoor funfair which works on a ticket system. It was £1 for Stew and Santi to go on the carousel, which I don’t think is too bad, but could add up if you have a few children who want to go on rides. 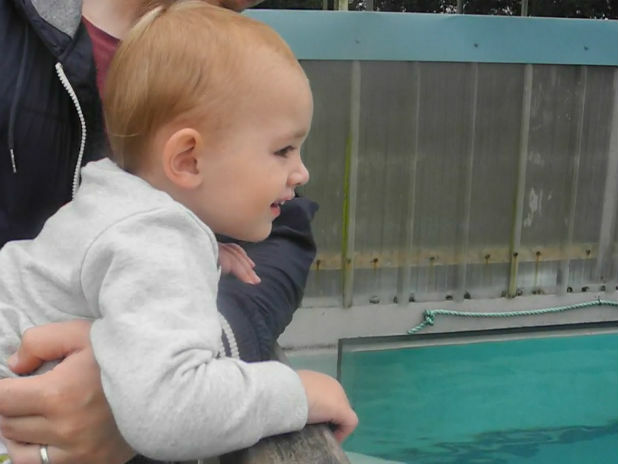 The great thing about Folly Farm is that it’s big enough to have a range of animals – zebras, giraffes, penguins, monkeys, rhinos, lions – but Santi can happily walk most of the way around before getting tired (although on this particular visit he wanted to be carried more than usual). The furthest point is the rhino enclosure, which seems to be Santi’s favourite part even though he doesn’t pay much attention to the rhinos. He loves running around the display cases and roaring at us instead. Just before leaving, Santi had a play on the pirate ship outside. There are a couple of outdoor play areas, both shaped like ships, and one was being refurbished so it should be nice and new by our next visit. If you go on a nice day there are plenty of picnic areas, a big wheel, go karts, toy ride-on tractors and a lovely sand pit with diggers and trucks you can sit on.